Leicester extended their winning run in the Premiership to five games with a comfortable victory over London Welsh. 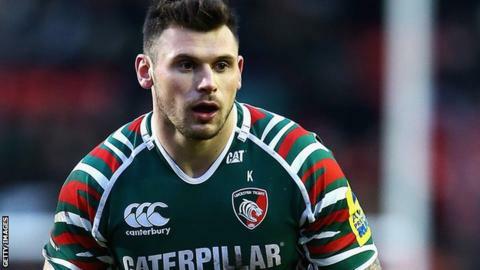 Adam Thompstone and Niall Morris scored tries either side of half-time to put the Tigers in control, while George Ford was ever-reliable with the boot. Gordon Ross kept Irish in contention, kicking all 12 of his side's points. But a late score by replacement Dan Bowden applied gloss to their victory, as Leicester completed a league double over the Premiership strugglers. Ross gave Welsh a surprise early lead with a third-minute penalty, before opposite number Ford kicked the Tigers ahead. The hosts quickly took control, although they had to wait until the 27th minute for their first try of the match. Some good approach play down the right wing put Thompstone clear and he jinked past the challenge of Sonny Parker to touch down, with Ford converting. The 19-year-old fly-half kicked a further penalty to give Leicester a comfortable 13-point half-time lead. Ross led an Exiles revival after the break, kicking nine points in the space of eight second-half minutes to bring the visitors within striking distance. But Morris went over almost immediately following a smart offload from Matt Smith and Ford again converted. Bowden skipped past a couple of challenges to score in the final minute, wrapping up a comfortable Tigers victory in the process. "These periods with double figures of guys missing you have to just win. "If you look at results around the other games today, sides are getting beaten and dropping off so you just have to take the points that are on offer. "I'm not going to be disappointed with the performance. It was about winning. These are banana skins to avoid. You've got to win them, and we did." Leicester Tigers: Tait; Morris, Smith, Allen, Thompstone; Ford, Harrison; Ayerza, Hawkins, Mulipola; Deacon (capt), Kitchener; Croft, Salvi, Crane. Replacements: Chuter, Brooks, Balmain, Slater, Deacon, Young, Bowden, Murphy. London Welsh: Arscott; MacKenzie, Tiesi, Parker, Scott; Ross, Keats; Montanella, Briggs, Bateman; Mills (capt), Corker; Balding, Hills, Jackson. Replacements: George, Bristow, Tideswell, Purdy, Williamson, Jewell, Henson, Lewis.